Fans are shown enjoying a recent performance of “Eight Days A Week,” the Beatles tribute band performing Saturday evening at the Highland County Senior Citizens Center in Hillsboro. 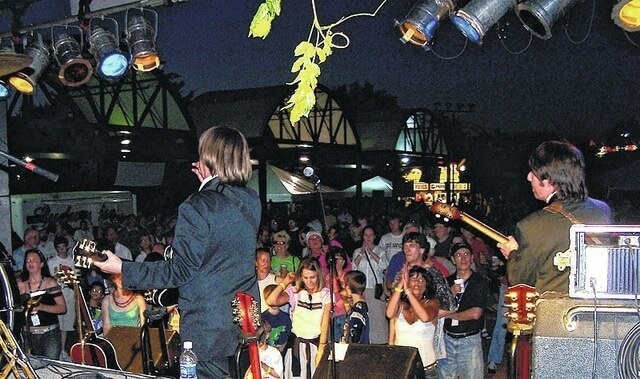 When a Beatles tribute band performs Saturday at the Highland County Senior Citizens Center, it will bring back fond memories for local fans who grew up with the music and admired the four Liverpool lads who conquered the world. Meanwhile, the leader of “Eight Days A Week” said Wednesday that his tribute band started about 15 years ago after he realized he had added a considerable number of Beatles songs to the repertoire of his former classic rock band. So he quit his band and began running advertisements for players who could emulate the different Beatles. “I auditioned a bunch, and started up the group,” he told The Times-Gazette in an interview by phone Wednesday afternoon. Rouse said that while Elvis tribute artists were plentiful, putting together a good Beatles band was “a little tougher,” and involved finding three players who could pull off portrayals of Paul McCartney, John Lennon and Ringo Starr to complement his George Harrison, both in terms of appearance and musicality. Rouse takes pride in his band’s level of authenticity, pointing out how many instruments, especially guitars, are duplicates of the actual instruments used by the Beatles. “We carry $30,000 worth of guitars and other equipment,” said Rouse. Rouse said the group’s show includes costume changes and covers the gamut of the Beatles experience, ranging from the early “mop top” look and original hits, through the “Sgt. Pepper” era and beyond. “We try to make it more or less chronological,” said Rouse, starting with what he termed the “Sullivan suits” – based on the band’s famous appearance on the Ed Sullivan Show in 1964 – through “the Pepper stuff.” He said the first set covers the band’s music through 1966, and the second set highlights music from 1967-70, although they close with some rousing early ‘60s hits. Rouse said the Beatles’ melodies are timeless, and even today audiences are moved to get on their feet to dance and celebrate the music. Jennifer West, director of the Highland District Library, said Wednesday she is looking forward to Saturday’s show. “I remember when they came over” to America from England, she said. She doesn’t recall seeing them on the Sullivan show, but caught them on “Shindig,” a popular music and dance show of the 1960s. “My babysitter let us stay up and watch,” she recalled. West said the Beatles were “four really vital young men,” and as time went on, “also very talented.” She said they were fortunate to have a producer like the legendary George Martin, who worked with them and allowed them to experiment with different musical forms. “’Sgt. Pepper’ is still an amazing album,” said West, noting that rather than simply serving as a collection of individual, unrelated songs, it was the first album to create a theme. Doug Farber, who owns and operates Single Office Stop (SOS) in Hillsboro, said he was “too young” to remember the Beatles’ first TV appearances, but became a fan based on the “Meet the Beatles!” album. The Beatles are “still so relevant and accepted,” he said. While he never saw the Beatles in person, he did see McCartney with his later group, Wings, at Madison Square Garden in the 1970s. He also saw the popular Broadway show, “Beatlemania,” at Winter Garden in New York during that same period, and more recently saw the Cirque du Soleil “The Beatles LOVE” performance in Las Vegas. Ann Runyon-Elam, inside sales rep for The Times-Gazette, said she has seen “Eight Days A Week” perform. “They did a good show,” she said. She said she that while she was too young for the Beatles’ original invasion of America, she became a fan later of Paul McCartney and Wings. She said the tribute band has the right look and sound and fans will enjoy their performance. Rouse said Wednesday that fans of the Beatles will enjoy an evening of excellent music and great memories. He said some recent shows have been rained out, and the band is looking forward to playing an indoor venue. “We will put on a good show,” he said. On Saturday, the doors will open at 6 p.m. and guests will enjoy a sit-down dinner of “Sgt. Pepper’s chicken,” green beans in butter cream sauce, potatoes, drinks and fresh fruit in a Jello mix with whipped cream. Shortly before 7 p.m., the band will arrive at the senior center riding in a limo with screaming fans. “For people who were here for the Mark Twain event and saw him come down the street in a horse and buggy, that’s what it will be like,” said Mechell Frost, senior center director. There will be a dance floor area and the center will be decorated appropriately, Frost said. Several door prizes including a Beatles anthology book valued at $40 will be given away. Tickets are on sale at the senior center, open from 8 a.m. to 4 p.m. Thursday and 7 a.m. to 4 p.m. Friday, and at Merchants National Bank’s main branch in Hillsboro. Tickets are $15 in advance, and $18 at the door the night of the show. The event is being sponsored by Merchants National Bank and DDS Lesia Langston-McKenna and Judge David McKenna, along with several co-sponsors. For more information or to reserve tickets, call 937-393-4745. Photo: Fans are shown enjoying a recent performance of “Eight Days A Week,” the Beatles tribute band performing Saturday evening at the Highland County Senior Citizens Center in Hillsboro.